AddFreeStats Analytics is a free web traffic analyzer tool that offers advanced website statistics and provides useful data concerning your Weebly website. AddFreeStats monitor your visitor activity in real-time. See what the most popular pages on your website are? Where your readers located are? How they found your sites, and much more. AddFreeStats is the perfect choice for tracking and monitoring your Weebly website traffic. 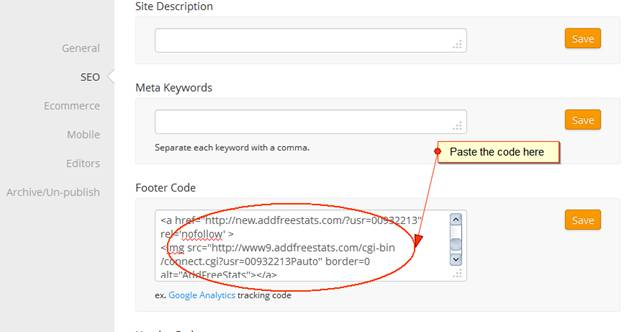 AddFreeStats tracking code utilizes the browser’s ability to load files asynchronously. This means that AddFreeStats tracking code speeds up the render of your website pages. Here is a quick installation guide on how to install Addfreestats tool on your Weebly site. 1)	First, you need to create a free account on Addfreestats.com . You will get a unique tracking code to place on your Weebly site. 3)	Next, you should log into your Weebly account and select the site that you want to work with on the installation of the tool. 4)	Next click on the "Settings" button on the site page. 5)	Next click on "Search Engine Optimization SEO" from the options on the settings page. 7)	When you have pasted the code, now click on the Publish button to complete the process and save the changes. It is that easy; the Addfreestats code has now been successfully integrated into your Weebly site and should now be fully working. The tool will take note and monitor all traffic information on your Weebly site. How to view your Weebly website statistics? To access the traffic analysis at anytime, you should click on the Addfreestats button on the footer of the website installed in or you can login on AddFreeStats website.